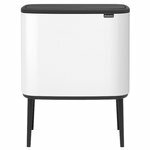 Brabantia’s Bo Touch is a beautiful and functional waste solution for the home. Made of elegant and durable coated steel, Bo Touch bin is equipped with two separate inner containers and a silent and odour-free lid that opens simply by touching it softly. Thanks to its rectangular shape, Bo fits easily against the wall, and its non-skid base keeps the container steady and protects the floor. 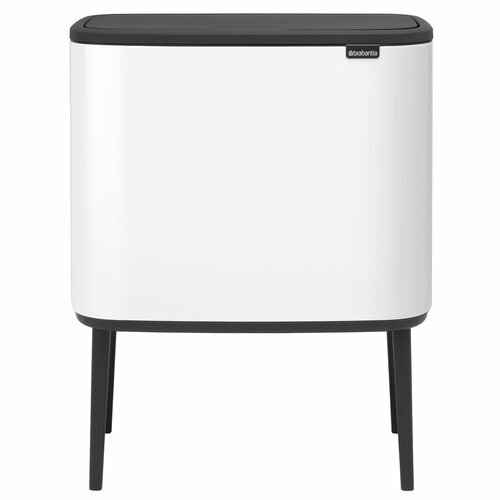 The adjustable legs give Bo Touch an airy appearance and convenient height. The waste bins of Bo collection have been given a Cradle to Cradle certificate at the Bronze level. They are manufactured in Belgium and they come with a 10-year warranty. Body: coilcoated steel. Inner bucket: recycled polypropylene. Bottom: polypropylene. Lid: polycarbonate, PBT. Includes samples of Brabantia's PerfectFit bin liners. Clean with damp cloth and all-purpose cleaning agent. Stainless steel is easy to clean with a micro-fibre cloth and glass cleaner. Do not use aggressive or abrasive products.